Victory Gardens is working on an exciting Newcastle City Council funded (NCC) community project to establish an edible garden in the Hunter St Mall. This project has been made possible via a NCC “Make Your Place” Grant. 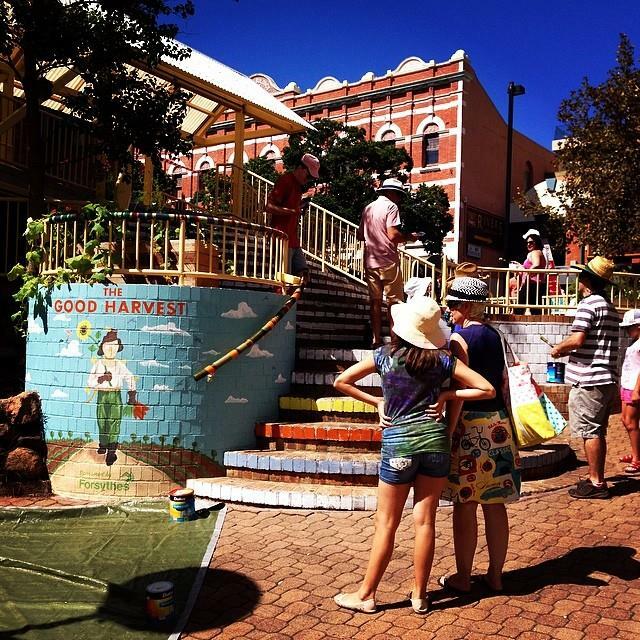 The Hunter St Mall Victory Garden, as it will be known, will bring the urban farming movement to the Newcastle CBD for the first time, in a creative and engaging way. The aim of the project is to demonstrate the use of edible gardens in and around the Newcastle CBD in underutilised spaces for the purpose of cultivating vegetables and herbs for community consumption. The space for the garden is in the centre of a growing creative hub. Renew Newcastle, The Roost, Pocket Design and Studio Melt are just some of the creative enterprises located around the perimeter of this garden site. It is envisaged that this site could easily become a meeting place from which collaborations and creative projects are nurtured and ideas flourish. There are also retail outlets, cafes, businesses and a post office in close proximity, making it a busy thoroughfare. Enhancing it with seating, edible gardens including citrus, herbs and companion flowers, small vertical garden beds and bright murals will make it an inviting destination to engage with a colleague, friend or business prospect. It is also envisaged that the garden will have a reciprocal relationship with surrounding businesses. The edible garden and flowers can be used by the businesses and in turn their use of the garden will help to activate the space.